LaunchPoint has completed optimization and development for a high efficiency, high power density, Halbach array electric motor. With a total weight of only 1.4 lb, this motor produces 7 horsepower at 8,400 RPM with 95 percent efficiency. At 5 horsepower per pound, this motor has a higher power density than any other motor on the market. 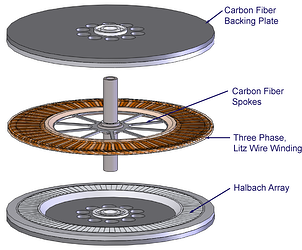 The brushless, axial flux permanent magnet design is highly tolerant of temperature and centrifugal effects, and the ironless rotor and stator eliminate iron eddy-current and hysteresis losses. 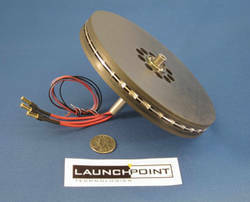 LaunchPoint's halbach array motors serve are the cornerstone of ouy hybrid electic UAV systems. LaunchPoint received initial development funding through a Phase I Small Business Innovation Research (SBIR) grant from the Defense Advanced Research Projects Agency (DARPA). 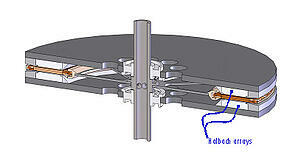 DARPA is interested in using the motor in electrically-propelled Unmanned Aerial Vehicles (UAVs). LaunchPoint Technologies is currently working with several defense manufacturers and multiple branches of the US military to incorporate this motor design into existing airframes. The LaunchPoint Halbach array electric motor, with its ideal combination of power, efficiency and light weight, offers the best solution for applications where performance is critical.